Running off Android and Philips own Smart TV, the new 9809 touts an incredible array of apps and games in eye-watering UHD resolution. 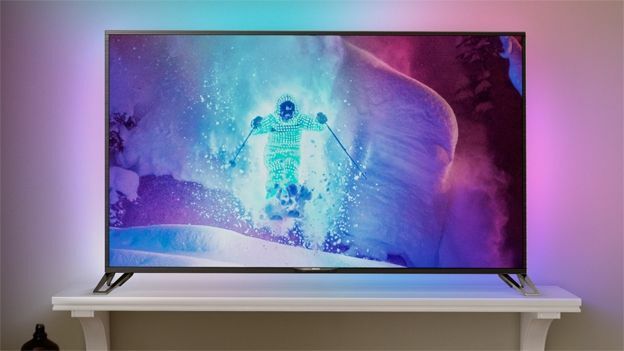 Philips has announced a sparkling new addition to its flagship 4K ultra-HD 9000 series, the tongue-twisting Philips 65PUS9809 - the first TV by a European brand to run on Android. The 65-in screen comes toting Google's Android OS, giving 9809-owners easy access to the Google Play store, as well as Philips' own Smart TV platform. The combination of services means you'll be have access to a smorgasbord of apps and games direct through the TV, scrapping the need for a separate set-top box. The 9809 boasts an impressive 4K UHD display, and operates on the 'Perfect Pixel Ultra HD' engine, digitally adjusting footage on the screen in real-time to optimise the image quality. This optimisation works using two core technologies - Bright Pro and Micro Dimming Premium. The former doubles the light quality compared to a standard LED backlit screen, providing deep velvety blacks and crisper highlights. The latter analyses the images on screen and adjusts the backlight accordingly to deliver the most appropriate contrast at any given time. It also features four-sided Ambilight tech, meaning all sides of the actual television light up with an ambient glow that complements the main colours you're seeing on screen. Philips' new tube also packs some serious beat-potential, shipping with its own wireless subwoofer, working alongside the acoustic-enhanced 'surround sound sensation' audio system built into the actual TV. There's no specifics on a release date just yet, but Philips says its 9809 super-screen will be available at some point in Q3 2014 as part of its European/Russian launch. There doesn't seem to be a price set yet either, but considering last year's 65-in 9708 4K TV cost about 4,999 euros (about £4000), we're expecting a similar mark-up this time around.